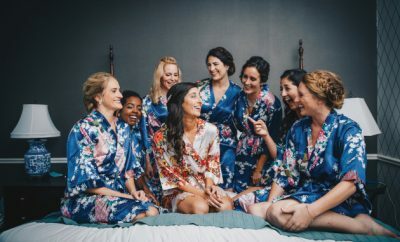 Here are some of our favorite ideas on how to transform the old, the new, the borrowed and the blue into your vintage themed wedding! 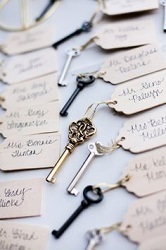 Something Old: Use antique keys as wedding favors or place cards. These little gems can be found at any antique store or flea market. 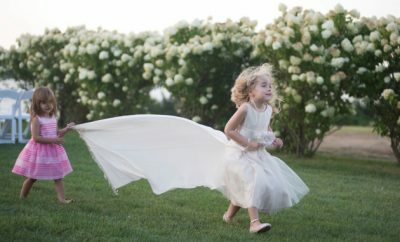 Mix and match styles to make them truly unique for each wedding guest. 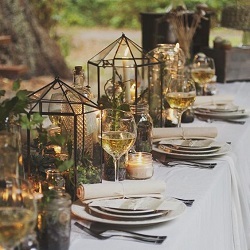 Something New: Decorate your tables with an abundance of lanterns, mason jars and candles for a simplistic, time-honored style. 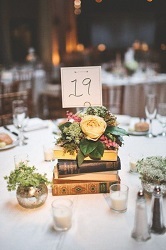 Something Borrowed: Go to thrift stores, flea markets and yard sales to find vintage books to add height the tables by placing table numbers or flowers on top of a stack. Read your favorite poem to add to the romantic atmosphere. Something Blue: Incorporate blue flowers in centerpieces, bouquets and boutineers. 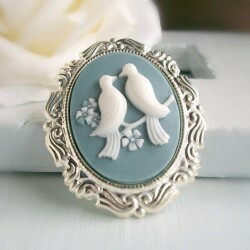 To add a vintage touch, add a beautiful blue brooch or decorative pin to your wedding dress. For more vintage inspiration check out our Pinterest board, Something Vintage.